Jon Foote has ten year’s banking and business development experience in Sydney. 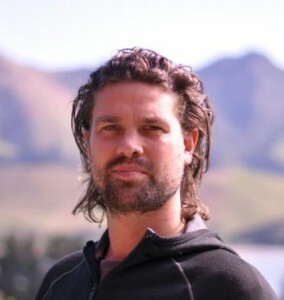 He has permaculture qualifications and busy permaculture design business ReScape. Jon is well underway with development of the Resilience Education Centre. (Am I an activist?). I guess so, I wouldn’t paint myself with a full activist brush. I’m passionate about the belief that we have a way out of the current situation and that we need to act on it. Nothing will change without action, and action in a positive direction is great. I’m not a big protester or create…what most activists do, and chain themselves to trees…I did a bit of that in Sydney and realised, you know I’m not achieving a lot – I’d rather go out and teach everyone how to grow food. The activist part of me says ‘you know if we grew our own food, and we had organic farmers, and lots of local systems going on, that in itself will bring down the industrial food system’. So in a way I may be an activist, but I want to do it in a way that is positive so that people can work towards something that is actually beneficial – its not just grumping about things that are wrong. So let’s do the things that are right.